wood, plaster, paint, images, lights, video, lcd screen, media player, speakers, transformer. 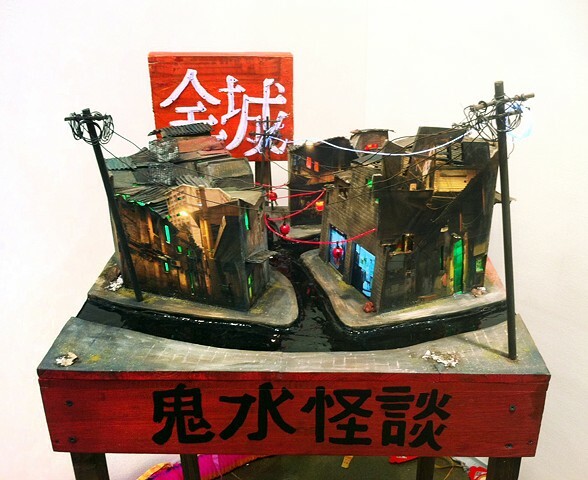 Night Town is a sculpture made up of images taken in a small, older neighborhood of Shanghai. Surrounded by modern high rise buildings, the crumbling enclave holds on for dear life, but will probably not exist in a year or two. Videos of a rooftop shack, store, and Chinese Muslim noodle puller are incorporated. The sign behind the town says "Whole Town".